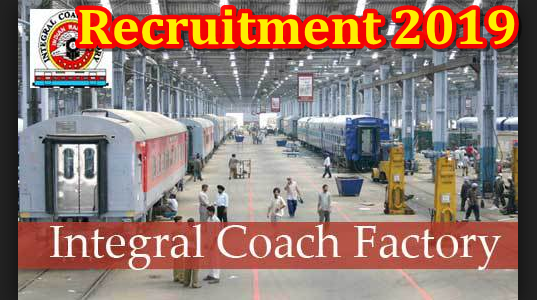 Integral Coach Factory Recruitment (ICF Recruitment 2019) has invited applications for the 220 Apprentice post. If you are interested in this ICF recruitment 2019, you can apply before the last date of application. Graduate Apprentice- Degree in Engineering or Technology in Mechanical Engineering and relevant discipline in Electrical and Electronics Engineering. Technician (Diploma) Apprentice - Diploma in Engineering or Technology given by a State Council or Technical Education Board established by the State Government in the relevant subject. You can see detailed information in the official notification issued by the corporation. Selection of candidates will be based on merit. How to apply for ICF vacancy: Interested candidates can apply online through the ICF website, http://www.icf.indianrailways.gov.in or NATS portal, from 21.01.2019 to 04.02.2019.